Ideal tasty treat for a party and the kids will love them! Firstly, prepare the chocolate icing, as you need the mixture to rest for 3 hours. Melt the chocolate in a bowl over a small pot of simmering water. In a second small sauce pan, bring to boil 110g of cream. Pour the cream into 3 time in the chocolate, stiring briskly to create a shinny chocolate. When the chocolate is combined, pour the 270g of cold cream into the chocolate, add the flavouring. Leave to set 3 hours in the fridge. Preheat the oven to 180°C /350°F/Gas Mark 4. In a mixing bowl whisk together the eggs and caster sugar. Whisk thoroughly to obtain a light and fluffy mixture or until a ribbon of a figure of 8 lies in the batter for a few seconds, this is easier to obtain if using an electric whisk. Next add in the natural yogurt, then the melted butter. Gently fold in the flour, cornflour and baking powder, then add the orange zest and the chocolate pieces. Prepare the cupcake papers case in the muffin tray and divide the yogurt cake batter between the 12 cases then dust each with a little icing sugar. Bake in the oven for 12-15 minutes or until cooked through. 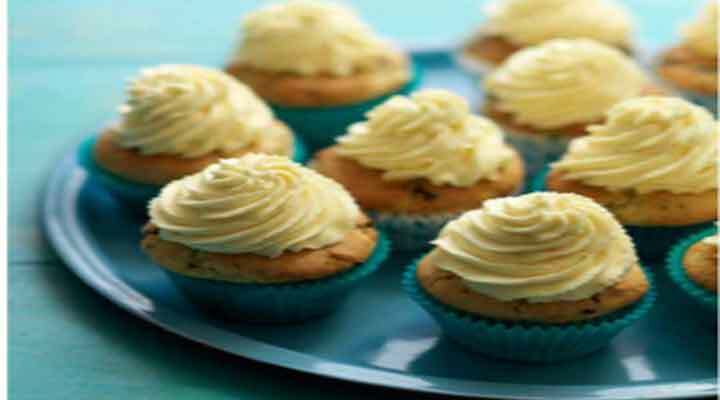 Remove the cupcakes from the tray and allow to cool on a wire rack. Remove the icing from the fridge and wisk with an electric batter until smooth and light in texture. Fill a piping bag fitted with a star shape nozzle, and pipe on the cupcake.